Looking for 2013 Fourth of July events? This blog post is about 2010 events, but you can find this year&apos;s July 4th events at columbiacvb.com/fourth-of-july. 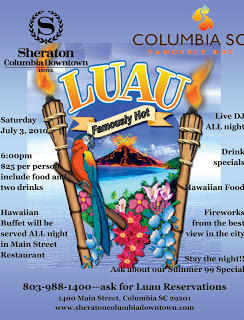 Say Aloha to the Sheraton on Saturday, July 3 to celebrate the Fourth with a Hawaiian luau starting at 6:00 pm. 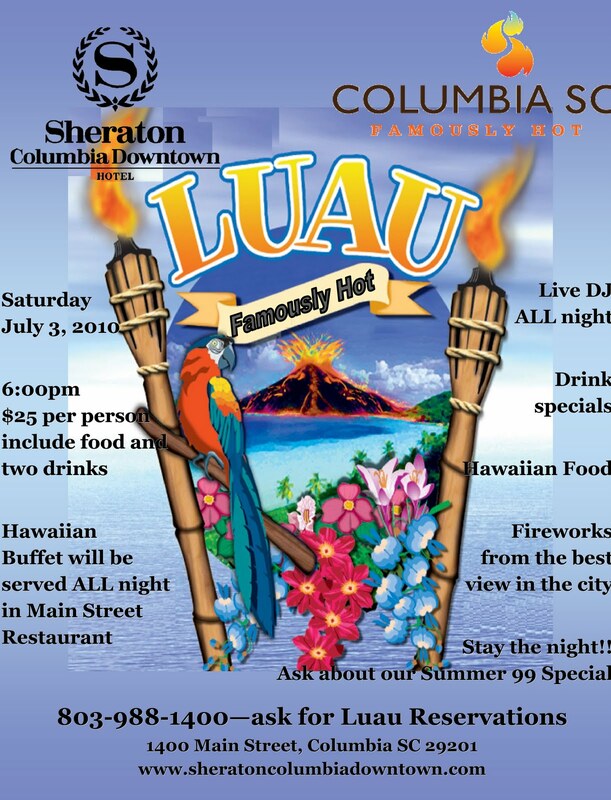 Enjoy a live DJ and full Hawaiian buffet served all night. Watch the fireworks from the Roof Top Bar, and even stay the night for a discounted rate with the Summer 99 Special! This star spangled event will feature a boat parade, fireworks and live music. Spend Saturday, July 3 at the Lake Murray 4th of July Celebration, watching the Annual Boat Parade at noon, then visit Dreher Island State Park for a concert by the Lake Murray Symphony Orchestra at Shelter 14 at 8:00 pm. Stay lakeside for the fireworks display at about 9:15 pm. View the Lake Murray fireworks on Saturday aboard the Spirit of Lake Murray on Saturday, July 3 and enjoy a night mingling on the water, complete with heavy hors d&apos;oeuvres, a bar and live DJ. Limited seating is available, so make sure to reserve tickets if you&apos;re on board! Feeling patriotic? Venture out to Fort Jackson for a cannon salute to each state in the US, patriotic music by the 282nd Army "Victory" Band and a full 3o minute fireworks show at the Torchlight Tattoo on Saturday, July 3. What&apos;s more American than baseball and hot dogs? 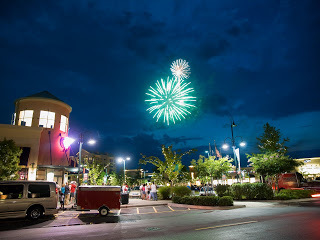 Watch the Columbia Blowfish take on Florence at Capital City Stadium and enjoy an Independence Day fireworks show after the game. Game starts at 6:05 pm on Sunday, July 4. Celebrate the fourth with a day full of fun and festivities at the Freedom Festival and Crafty Feast on Sunday. Richland County, the Boyscouts of America and Village at Sandhill will host a full day of live music, local crafters and artists, a bike display by Thunder Tower Harley-Davidson. a NASCAR simulator and helicopter and hot air balloon rides. Don&apos;t miss the Boy Scouts&apos; patriotic program at 5:30 pm and a professional fireworks show at 9:30 pm. You don&apos;t want to miss the launching of the Midlands first ever Hot Air Balloon Festival at Blythewood Community Center! Festivities begin at 5:00 pm on Friday, July 2, with tethered Balloon Rides, great music by Fatback and the Grove Band, an outdoor movie (featuring "UP! "), Smoke Southern Barbeque, and the night will end with the hot air balloons glowing in the sky. Saturday, July 3 all of the balloons will launch at 6:30 am for a balloon race. The finale will be Saturday night at 7:00 pm with more beautiful glowing balloons in a mass ascension. View full calendar event. Looking for something different to do this Fourth of July weekend? Conjure up a few laughs at the Comedy House Theatre for an 8 pm show on the Fourth with comedian Corey Holcomb. You don&apos;t have to travel far for a full-out festival! Celebrate America&apos;s birthday and Lexington County&apos;s 52nd year with the annual Peach Festival featuring parades, pageants, food, fireworks and more at Gilbert Community Park in Gilbert, just outside of Columbia on Saturday, July 3. Visit the Lexington County Peach Festival site for details. View full calendar event. Head over to neighboring Newberry County for family fun at Newberry High School for the 20th Annual 4th of July Celebration from 6:00 to 10:00 pm, featuring free amusement rides for the kids, a skydiving exhibit, live music and a fireworks show on Sunday, July 4. View full calendar event. This Sunday, July 4, take a short drive to the Jammin&apos; July 4 at Dillon Park in Sumter for rides, food, drinks, live entertainment and, of course, fireworks. It&apos;s a quick trip from Columbia for a full day of excitement and fun! View full calendar event. Want to make a weekend out of it? Let the Roaming Gnome be your guide to a smashing hotel deal through our online Travelocity reservations system -- or book one of our featured weekend getaway packages on experiencecolumbia.com. 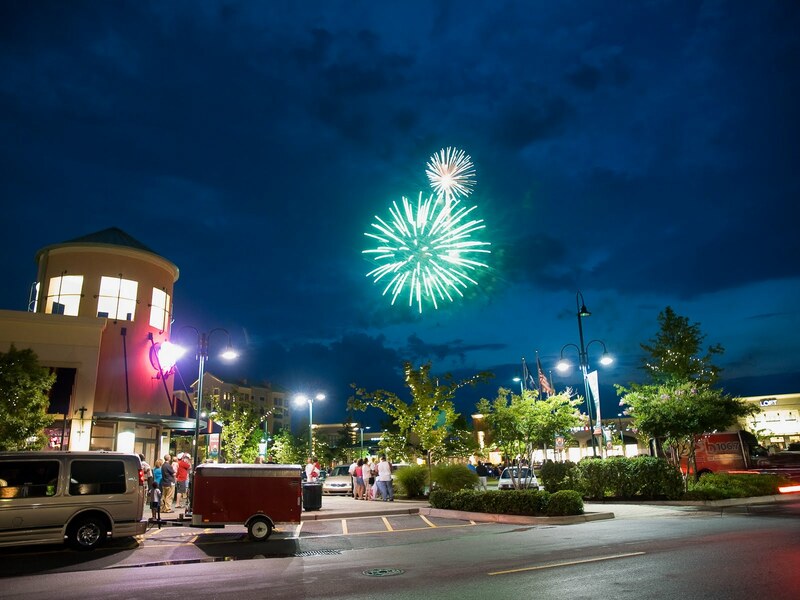 Whether you&apos;re looking to kick back for some leisurely cruising on the lake, check out a dazzling fireworks display, or celebrate in the midst of all-day entertainment, the Columbia region has it all this Fourth of July! To find out more about things to do in Columbia, SC and its surrounding areas, visit www.columbiacvb.com/calendar for a complete listing of events and activities. For up to the minute tips on things to see and do, keep up with us on Facebook and Twitter.